Eighteen rhino have been found slaughtered at a top game park, with their horns cut off, and environmentalists are pouring scorn on the official explanation for the massacre. Limpopo's Department of Environmental Affairs said yesterday officials had stumbled across the rhino remains on the Letaba Ranch Game Reserve during a "routine census" in the past two weeks. A preliminary investigation revealed that the rhino were killed on the 42000ha reserve attached to the Kruger National Park between 2005 and 2008. But environmentalists have dismissed this explanation, saying that, in a reserve frequently crossed by hikers and tourists, it would have been impossible for the carcasses to have lain unnoticed for so long. The department said yesterday officials undertook a "routine" game "census" over the last two weeks, during which they discovered the carcasses. But spokesman Joshua Kwapa admitted that some of the rhino carcasses had not yet decomposed, casting doubt on the official timeline of the killing of the animals. News of the latest rhino killings broke as the country battles sophisticated poaching syndicates which feed the trade in rhino horn. SA National Parks spokesman Wanda Mkutshulwa said that, as of Saturday, 261 rhino had been killed for their horns this year. This excludes the 18 discovered at Letaba. In comparison, 122 were killed last year, and 83 in 2008. Said Kwapa: "We found [the dead rhinos] a week or two ago. Some of them are just bones ... Nine of the 18 were in our register and we could account for them. We are still investigating the other nine, to account for them. We have launched a thorough investigation to try to understand what happened." Letaba employees, who said park officials were "startled" by the discovery of so many dead rhino, added that only after an "intensive" investigation would they be able to say exactly what happened. But Faan Coetzee, rhino security project manager of the Endangered Wildlife Trust, questioned Letaba's security, asking if it was possible to go for more than five years without discovering "so many carcasses". "It is very disappointing to hear something like that. Their security is questionable. How can they go for five years without discovering them? There is something they are not telling us," he said. Letaba is part of Limpopo's Ivory Trail tourist route, popular with international and local visitors. Kwapa was unable to say why nobody had noticed the carcasses, or if Letaba employed guards. He could also not say when the last game census was held, or how many rhino lived on the reserve, where animals can walk freely between the ranch and the tourism flagship, the Kruger National Park. It was reported early this year that many provincially administered reserves in Limpopo were in chaos, with no rangers to combat poaching or the illegal gathering of firewood by villagers. 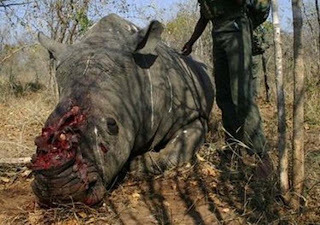 Earlier this year, a report titled "Hunting in South Africa, a Bloody Mess", by Animal Rights Africa, said that "Traffic, an organisation that monitors the illicit trade in wildlife and plants, showed that as many as 200 rhino horns might have been illegally laundered by hunters and hunting operators". "Rhino poaching in South Africa has reached its highest level in modern times," the report said, adding that the animals were shot under the pretext of trophy hunting but their horns were sold on the traditional medicines market. 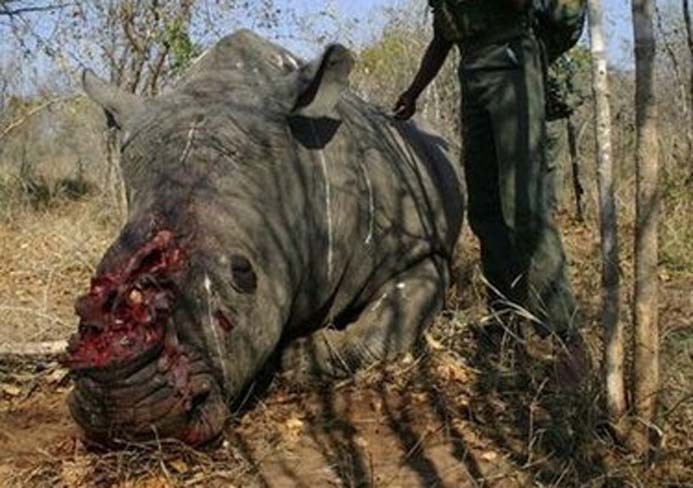 Mkutshulwa said 133 people had been arrested for rhino poaching in the past two years. Police believe highly sophisticated syndicates, consisting of veterinarians, wildlife experts and game farmers, are involved in the trade. A team of police officers and officials from the National Prosecuting Authority, SANParks, the Department of Home Affairs, the SA Revenue Service and game farm owners was assembled early this year. Mkutshulwa did not want to reveal how they planned to catch the poachers because this would warn poachers of what to expect. 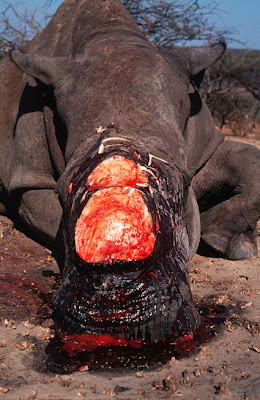 According to the Convention on International Trade in Endangered Species, trade in rhino horn is illegal. But this has failed to stem demand for the powdered substance, used in Asian medicines and touted as a cure for cancer. SANParks chief executive David Mabunda said in July that it was "no longer appropriate to refer to this spate of illegal killing as poaching, given the levels of sophistication, violence, precision and the money behind it". "We are dealing with unprecedentedly high levels of organised crime, which the police and all security agencies are helping to defeat. "We have worked hard to bring this species back from the brink of extinction and we will continue to defend it even if we become the last man standing." This is just so funny "The Amazing Race"
You want me to smell what? Now you tell me this is not a good Vodka advert! Now here is a right proper balls up!!!! Bulls come and bulls go what about the cow?